The following short booklet is a collection of four short manzums (poems), two on the science of ‘aqidah, one on the terminology of hadith, and the last on inheritance law. 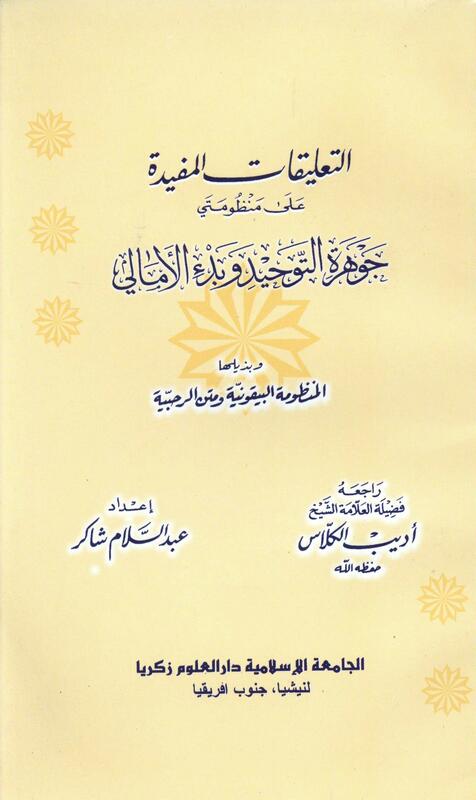 The first two, the famous Jawharat al-Tawhid and Bad’ al-Amali, include brief but beneficial notes in the hashiyah. The book was reviewed by the recently deceased Shaykh Adib Kallas (may Allah have mercy on him). The scan uploaded here may have some problems with the margins on a few pages. It was scanned from a Darul Uloom Zakariyya photocopied print and was stapled together, making it difficult to fit on the scanner. As for the translation of Jawharat al-Tawhid , I found maby mistakes so far, I hope I can correct them all and send them to you, soon!